On Christmas Eve, 24 December 1984, 124 artefacts were stolen from the Museo Nacional de Antropología in Mexico City. The majority of these objects were the results of modern archaeological excavations within Mexico, and several of them had passed into use as national symbols. The most famous piece taken was the jade mosaic funerary mask of K’inich Janaab’ Pakal who ruled the Classic Maya polity of Palenque for sixty-eight years until his death on 23 August 683 at age 80. 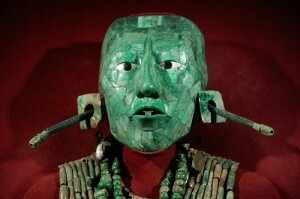 The mask was located in Pakal’s intact tomb, which was discovered by archaeologist Alberto Ruz Lhuillier within Palenque’s Temple of the Inscriptions. The tomb was uncovered in 1952 after four years of painstaking excavation and Pakal’s funerary objects quickly become some of the most well known objects of Maya art. Besides Pakal’s funerary mask, a number of other jade and gold objects were also stolen, including gold artefacts recovered from the famous Cenote of Sacrifice, a natural karstic well at the Postclassic Maya site of Chichén Itzá (Boone 1986). Nine police guards were on duty during the night of the theft but, perhaps due to the holiday, were not very vigilant. 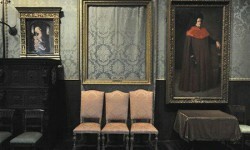 Although the guards were supposed to visit each room of the museum at least once per hour, the thieves were able to open seven glass display cases in three different exhibition halls, and the theft was not discovered until the day shift of guards arrived at eight in the morning (Los Angeles Times 1985). Some reports indicate that the guards were either drunk or sleeping during the theft (Miller 1989). At the time, the museum did not have an electric alarm system. While some Mexican authorities speculated that the objects would appear on the international market, most experts viewed the objects as far too famous to be sellable, speculating that the thieves might destroy the artefacts once they found that out (Los Angeles Times 1985). Experts noted that the thieves stole the highest quality, most valuable portable objects in the museum and concluded that they were professionals. In June 1989, 111 of the objects were recovered from a house in the México City suburb of Satelite (Miller 1989). Carlos Perches Treviño, age 28, was caught in the home and a warrant was issued for the arrest of Ramón Sardina García, age 30. According to Attorney General Enrique Alvarez del Castillo (Miller 1989), Perches stated that the two men, both veterinary school dropouts, had planned the heist for six months. They made more than fifty trips to the museum, taking photographs, examining the display cases, and watching the security guards. They crawled through an air conditioning duct into the basement of the museum’s Maya Room and spent thirty minutes removing pieces from their cases and placing them in a canvas suitcase. They left the museum through the same duct and never saw a security guard. The men had no clear plan of what to do with the artefacts and the suitcase was hidden on top of Perches’ closet for a year until he moved to Acapulco. There he made contacts with drug traffickers to whom he tried to sell the artefacts in return for cocaine. When the deal never came through, Perches returned to Mexico City with the objects. It was one of the traffickers, Salvador ‘el Cabo’ Gutierrez, who turned Perches in to the authorities following his own arrest (Miller 1989). Perches was charged with theft of a national treasure and he was also said to face cocaine trafficking charges. The stolen artefacts were reported to be in good condition, although a mask portraying the Zapotec bat god Murcielago from the site of Monte Albán required repair. Boone, Elizabeth H. (1986), ”Old Friends’ Stolen From Museum Remind Us of Symbols ‘Importance”, Los Angeles Times, 15 January. Los Angeles Times (1985), ‘Priceless Relics at Mexico City Museum Stolen’, The Los Angeles Times, 27 December. Miller, Marjorie (1989), ‘Museum’s Priceless Pre-Columbian Artifacts Recovered: Mexico Miracle: Stolen Art Found’, The Los Angeles Times, 15 June.